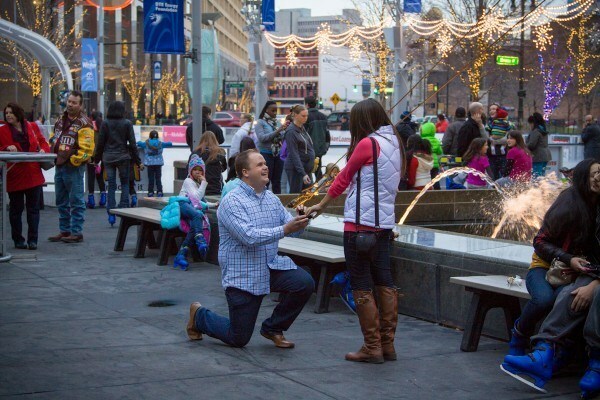 How many people dream of that perfect proposal moment with the ring of their dreams? Brad Reed created just that for his girlfriend Ashley Lewis. 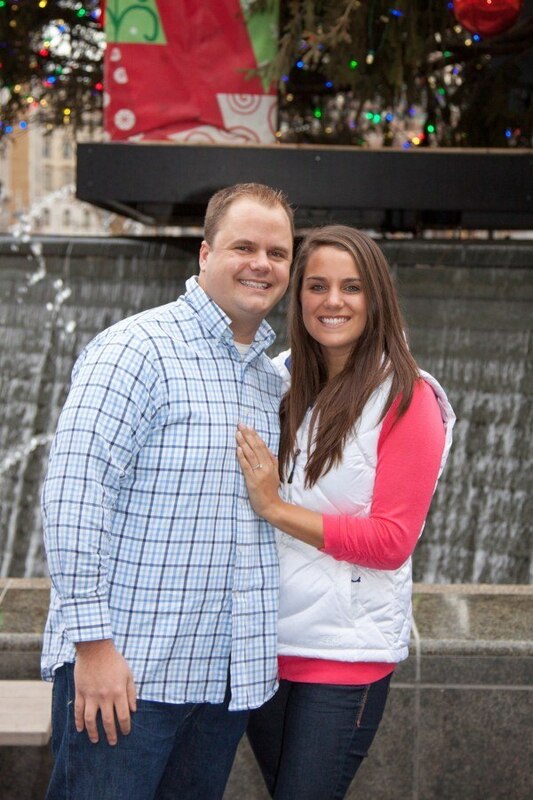 Brad and Ashley, both Michigan natives, met through mutual friends at their favorite bar. After their initial introduction and subsequent run-ins on the town, the two became fast friends. After a time, and the urgings of their friends, Brad realized that there was something very special about his friendship with Ashley, so he asked her on their first official date in October 2011. 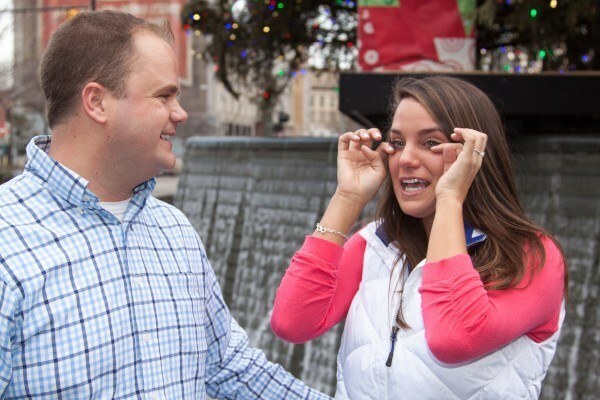 A little over a year later, Brad knew it was time to ask Ashley to marry him. After he began designing a custom ring with Rachel, our Design Manager here at Brilliance, his next thoughts were about setting up the event. He knew how important Ashley’s family is to her, so he wanted to be sure to include them in an experience that they would remember for the rest of their lives. Luckily, the family’s tradition of getting together every other month for a family dinner provided the perfect opportunity. Brad asked Ashley’s cousin Ami Morrison, a professional photographer, to shoot the event in an area of downtown Detroit called Campus Martius, where the city sets up an ice skating rink, lots of lights, and a huge Christmas tree ever year. Since Ashley knew that Brad had never been, he knew that she wouldn’t be surprised or suspicious when he suggested that they go. Ami and Brad chose January 12 for the date, and he went about getting Ashley’s relatives to arrange an off-month family dinner. Cathy and Doreen, two of her other cousins, were happy to arrange it, and with 25 family members set to attend, including all of Ashley’s immediate family, the plan was coming together perfectly. 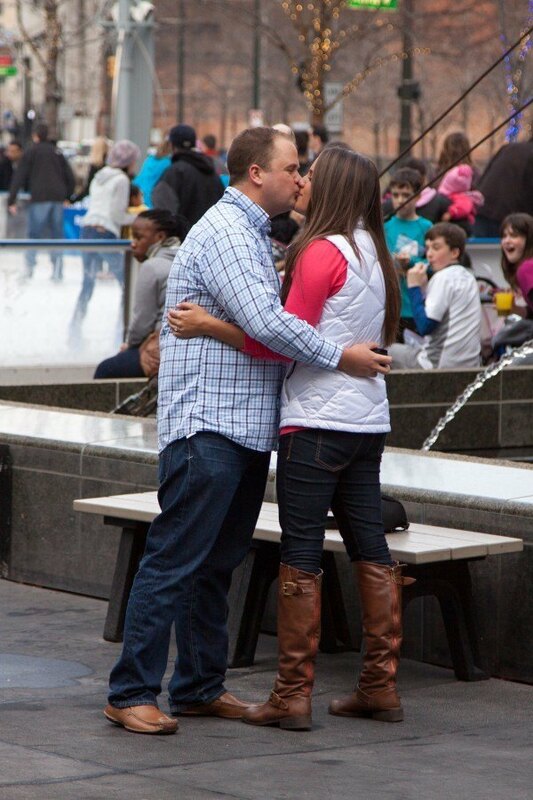 With Ami and her camera hiding behind the bushes, Brad brought Ashley to Campus Martius before dinner on the 12th. Ami’s husband and Cathy watched on with a video camera from a nearby restaurant while Brad brought Ashley to the arranged spot by a fountain at 4:30 PM. As Ami snapped pictures from the bushes, Brad dropped to one knee and asked Ashley if she would let him love her forever. In between tears and with a beet-red face, Ashley said yes! After a surreal moment, the crowd around them began applauding and congratulating the newly-engaged couple. After Ami captured a few more close-up shots, the couple made their way to dinner, where Ashley’s mother immediately noticed the sparkle of the ring on her finger, jumping out of the chair to give her daughter a hug.The rest of the night was a great celebration that Brad and Ashley will remember forever. Congratulations Brad and Ashley! Thank you for allowing Brilliance to be a part of your lives together! Pictures were provided by Ami Morrison and you can find her, and some of her beautiful work, at http://www.facebook.com/lllphotograph. 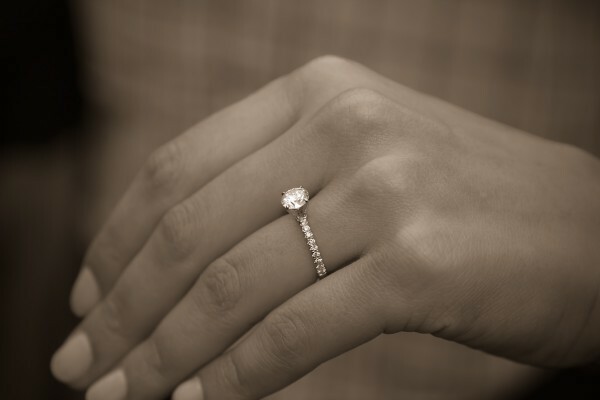 If you’re interested in creating a custom design of your own, please visit us at Brilliance.com, or call one of our diamond and jewelry experts at 866.737.0754 to get the ball rolling on your unique adventure.